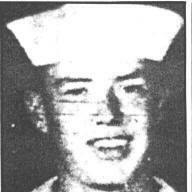 A03 William H. Reedy Jr.
Bill Reedy’s parents moved to Chico after he enlisted in the Navy, but the young man met a number of local acquaintances by running classified advertisements in the newspaper when he was about to come home on leave. Reedy continued to correspond with his new friends even while he was stationed on the USS Kitty Hawk in the South China Sea. It was on his final cruise before his enlistment was up that Reedy, an aircraft ordnance specialist, took off from the deck of the Kitty Hawk in an airplane with nine others aboard. According to a Navy release, the airplane veered sharply to the left as it lifted from the deck and then crashed over the right side of the carrier. Seven of the ten crewmen were rescued, but Reedy and two others died.